There is more information available on this subject at Tanzania on the English Wikipedia. Tanzania, officially the United Republic of Tanzania, is an East African coastal nation on Earth. It is part of the Unified Earth Government's East African Protectorate. The United Republic of Tanzania was first established in 1964, when it was formed from the union of the much larger mainland territory of Tanganyika and the coastal archipelago of Zanzibar. Julius Nyerere, independence leader, ruled the country for decades, assisted by Abeid Amaan Karume. Following Nyerere's retirement in 1985, various political and economic reforms began. By at least the 25th Century, Tanzania had become part of the East African Protectorate. Late in the 2400s, the EAP unsuccessfully attempted to re-nationalize a number of privatized industries that had previously been under state control. The United Nations Space Command established many bases in Tanzania throughout its history, especially capitalizing on the defensive capabilities of Mount Kilimanjaro, which had multiple bases built into its slopes. "Chief, Pelicans are at the river. We've got company, so hustle up!" Spartan-117 engages Unggoy during the Battle for Earth in a Tanzanian jungle. On November 17, 2552, late into the Battle for Earth, the Prophet of Truth arrived aboard the Forerunner Dreadnought. The Spartan-II John-117, after failing to kill the hierarch, bailed from the ship as it entered the Earth's atmosphere, and landed in a jungle south of Mount Kilimanjaro. He was recovered hours later by a contingent of marines and Thel 'Vadam. Before long, the group, aided by a few D77H-TCI Pelicans, engaged Covenant forces which been deployed to the jungle. Sergeant Major Avery Johnson and survivors of the Second Squad were captured and taken to the Covenant-occupied A2 Hydroelectric Facility. 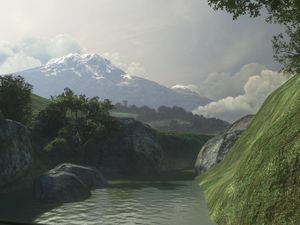 John-117 and The Arbiter made their way to the dam and worked to rescue the captives. After this, two Type-52 Phantoms appeared and dropped off reinforcements. The UNSC forces held off the attack until the pelican Kilo 023 arrived, destroying the Phantoms and extracting the humans and lone Sangheili to Crow's Nest in Kenya. During the fight against the Covenant, the city of Arusha became a hotbed of Covenant activity, but managed to survive and continue into the post-war period. Following the end of the war, the member states of the EAP, including Tanzania, donated gold ore for a statue of John-117 to be placed in the United Nations Space Command Memorial Park as part of Project Rebirth, a plan for the rebuilding and revitalization of New Mombasa. Tanzania consists of a large mainland portion north of Kenya and the Zanzibar islands off of its east coast in the Indian Ocean. One of the country's most prominent cities is Arusha. Tsavo Highway leads to and from Arusha. In terms of landmarks, there is Mount Kilimanjaro, a dormant volcano and Africa's tallest mountain. The northeast of the nation, where Kilimanjaro lies, is mountainous and home to dense jungles. The A2 Hydroelectric Plant during the Battle for Earth. Tanzania is heavily industrialized and largely controlled directly by the United Nations Space Command. Snowmelt from Mount Kilimanjaro was once collected and used to distribute water across the entire African continent by the Global Water Campaign via GWC trans-African pipelines. The GWC's main water treatment plant had fallen into disrepair by the 26th Century, but the government initiative continued to function at other locations, such as the A2 Hydroelectric Facility, which uses a flowing river to generate electricity. The aforementioned decommissioned plant was acquired by the UNSC in the early 26th Century and was used to conduct classified military training exercises for ingress/egress operations and as a template for War Game simulations, specifically WAR GAMES MAP_SET/: 673-15. The Zanzibar Archipelago is home to Wind Power Station 7 as well as the Karisu Holiday Resort. Wind Power Station 7 is affiliated with Buelterman Carney Cotton & Hayward Inc. and Traxus Heavy Industries. In 2007, the Society of the Ancients identified a petroglyph of the Forerunner Chrysopteron etched into a Tanzanian mountainside. What would become Tanzania prior to the Great Purification. Kilimanjaro at night. The Forerunner Dreadnought is visible in the sky. The abandoned water purification plant near Mount Kilimanjaro. An advertisement for the Karisu Holiday Resort. A Forerunner glyph found in Tanzania. 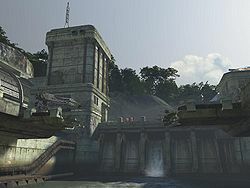 ↑ The map description for Halo 3's Last Resort says that Wind Power Station 7 was requisitioned for use as part of Spartan training exercises. It is unknown whether this refers to the War Games or if Spartans trained at the actual location. ↑ Society of the Ancients evidence page: This was just sent to me from a SOTA member traveling through Tanzania. The rock painting (as of yet undated) was pointed out last month by a local safari guide.